Bessie's War takes a look at the part women on the home front played in World War 1. Bessie is frustrated because her brothers and father are off fighting the war and she is stuck at home feeling like she can offer no help. When she discovers that the soldiers need socks she enlists the help of her whole class to knit socks for the war. Krista Bell is the author of 27 books for children. After publishing Jack's Bugle, a story of Gallipoli, Krista was inspired to write a companion book about children during Australia in World War 1. Belinda Elliott is an artist who enjoys creating books, drawings, paintings and sculptures. She illustrated Jack's Bugle, which was also written by Krista Bell. 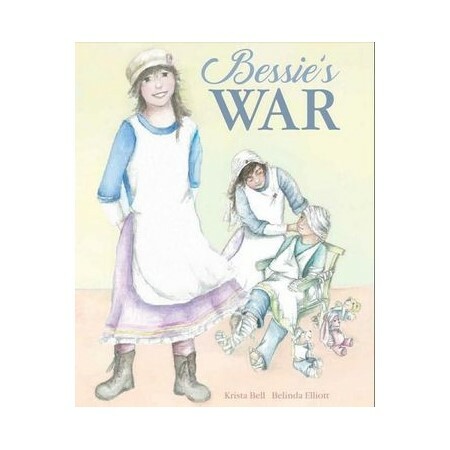 Bessie's War is her third picture book.